Okay, I’ll admit I’m a gal who gets pretty excited about bread. Maybe even more so than most people. But I really think this is a bread to rouse the masses! I mean, I feel religion calling, this is so revolutionary. What’s the big deal? It’s called “Artisan Bread in Five Minutes a Day” and it will rock your world. I’ll admit I haven’t actually read the book yet, since I’m on the waiting list at the library for it (though I’m sincerely tempted to go buy it), but the “master recipe” is available online (and below), and the website I linked to above has many variations to try as well. The concept? Basic mixing, no kneading, large batches which you refrigerate until needed for up to 2 weeks apparently, and the big one: totally amazing flavour and texture. After doing sourdough for years, this is a big about-face for me, and one that I’m ready for given that I will soon be tandem nursing and crying over un-co-ordinated nap schedules (Tiny Baby is due late September). It really did take about 5 minutes last night to mix up the dough, and maybe another 5 minutes today to tear off a chunk, form it into a ball, let it rest for a couple of hours and then bake it. I should also mention that my 2-year-old daughter and I almost polished off half the little loaf in one sitting, it was that good. So, without further ado, here’s the recipe that could very well change your life. Stir together the dry ingredients and then mix in the water. Stir until everything is hydrated–no dry spots–and then let it sit out for 2-5 hours, covered but not necessarily air-tight. Stick in the fridge at least overnight. 2 hours before you want to bake, cut off a “grapefruit-sized ball” with a serrated knife. Form into a boule with a nice rounded shape and a tight surface and let that sit either in a pan or on a cornmeal dusted board for 2 hours. After an hour and a half, start pre-heating your oven to 450 degrees F with a baking stone inside, and below that, an oven-safe metal pan to be used as a steam pan. 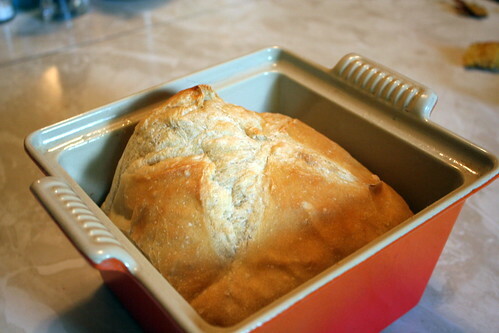 At the 2 hour mark, slash your loaf, stick it in the oven, and pour about a cup of boiling water into your steam pan. Let it bake for around 20 to 30 minutes. It is done when the crust is nicely browned and it gives a lovely hollow sound when you knock on the bottom of the loaf. To be good and frugal, consider roasting some veggies or apples alongside your loaf, or bung up a cake for after dinner. Though no one will want cake at a meal where you serve this bread. They’ll just want more bread. Then smile knowing you still have enough dough waiting in the fridge to make at least 3 more loaves! I mentioned yesterday that I recently bought a giant bag of Couscous from Grace Ottawa–ten pounds for ten dollars! An amazing deal compared to the huge prices for tiny packages at the grocery store. And now I have approximately 9.2 pounds of couscous left to eat. Luckily I’ve got 1 year to do it. The reason I’ve got 9.2 and not 10 pounds of it left is that we’ve eaten couscous twice so far this week. It’s my new summer side-starch! Like my search for a bread I can make that won’t raise the thermometer, I’ve also been looking for a starch I can prepare with a minimum of boiling/cooking (you may have noticed by now I’m a hopeless carb-o-holic!). Unfortunately brown rice, though flavourful and filling, takes 45 minutes of humidity-inducing simmering. Other starches like white rice, potatoes and pasta don’t need quite so long, but when I saw the couscous, I knew I had a winner. Couscous is made of durum semolina, which is basically pasta, but instant couscous (the kind I bought–lucking out, it turns out, since I didn’t know there was a non-instant kind!) has been previously steamed and then dried, and this is why it can be prepared by simply pouring a cup of boiling water poured over it and letting it sit for 5 minutes. While not terribly nutritious by itself, couscous extends and complements bean salads and other dishes remarkably well. I like to add a dressing, and then any number of chopped up veggies and herbs; whatever I’ve got left over really! Last night I threw together a can of mixed beans with some chopped red pepper, scallion, cucumber, cilantro, soy sauce marinated tofu, and the leftover sesame-peanut sauce I had from Thursday’s rice bowls. I added a bit more lemon juice for a flavour punch, and stuck it in the fridge to blend. It was a delicious and substantial salad that my girl and I ate out of the lid at the park for our supper. Another couscous recipe I love is tabouli: a background of couscous highlighted with diced peppers, tomato and chick peas, flavoured with lemon juice, olive oil and garlic, with a ton of chopped parsley to blend it all together. It keeps remarkably well, and is good as a dinner side, or by itself for lunch. I’ll be looking for other couscous recipes to try this summer, so if you have one you love, please share it. Hooray for no-cook summer dinners! Pour boiling water over couscous and let sit for 5 minutes then fluff with a fork. Meanwhile, blend together the dressing ingredients: salt, lemon juice, olive oil, garlic and pepper, and mix into couscous. Add the rest of the veggies and stir. Chill well before serving. I didn’t mention yesterday but on Tuesday I actually went crazy and at the same time as making flour tortillas, I also made corn tortillas! Bloggers, especially those living in New York City, really love their tortillas! Here is a post about making corn tortillas on 30 Bucks a Week (thanks Tina!) and another on Homesick Texan. I checked out Grace Ottawa after seeing it recommended on Ottawa Foodies as a place to buy Masa Harina–a specific type of corn flour that is recommended for making tortillas. Sure enough, they had it (and many other wonders and goodies, which I will report on tomorrow) so I grabbed a bag of “Masa Mix by Mr. Goudas (2 kilos for $4) and made my way home. Now these tortillas are also very delicious, and totally easy! Even easier than the flour variety. And the taste? Well, I imagine the Mr. Goudas brand is probably not the height of flavour, but even so, they were completely delicious. They smelled amazing and the texture was lovely and soft. I can’t wait to try frying these babies to make hard tacos and home-made corn chips. So, is it worth it to make your own tortillas? Absolutely! 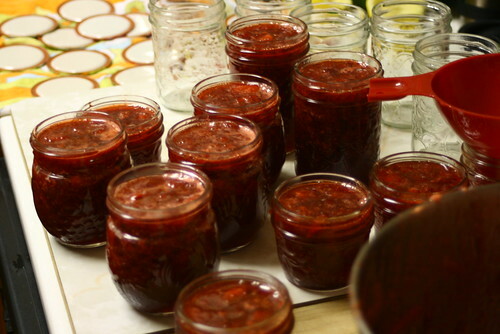 The flavour is incomparable, the ingredients are pronouncable and safe, they are fast and easy, and so CHEAP! While I don’t see the corn tortillas replacing bread for me for summer wrap sandwiches (not like flour tortillas), I also don’t see myself spending another penny on Old El Paso any time in the near future. I should add that I made them without the aid of a tortilla press, which Grace Ottawa also sells for $20. I’m guessing a tortilla press would make them even thinner, and thus do even more for the texture and flavour. I’m putting this gadget on my list of things to look out for at garage sales this summer. Mix the masa harina with salt, then add water and stir until it comes together as a soft dough. Knead for a few minutes until smooth. Let it sit, covered, for 15 minutes. Divide into 12 round balls and then cover so they don’t dry out as you press and cook. Next, flatten them into thin rounds using either a tortilla press with two circles cut from thick plastic wrap (like a freezer bag), or cover two heavy cutting boards with plastic wrap and use those to press the rounds. Heat a heavy bottomed cast iron skillet on medium. Cook tortillas 30 to 40 seconds on each side, or long enough to produce some browned spots on the surface. Enjoy with your favourite tex-mex or Mexican food, or fresh from the pan with some butter and salsa. Let me know if you try it! Since my tortilla-making adventure on Monday, I have begun a quest–QUEST, I say!–for the perfect tortilla recipe. I scanned the blogosphere and found a couple of references (here and here) to one recipe recommended as the most authentic flour tortilla to be found north of the US-Mexico border. I had to try it. Luckily it is a very easy recipe. It was also very very good, much better and lighter than the recipe I posted yesterday. The dough was also much easier to work with, given that it wasn’t sopping with lard. This is a tortilla one can eat two of and still have room for salad. I think *now* I have found my new summer bread. My next challenge will be making it on the barbecue, which I am sure is possible, with my cast iron pan–the goal being to continue to eat home-made bread throughout the summer, without heating up the house to make it. 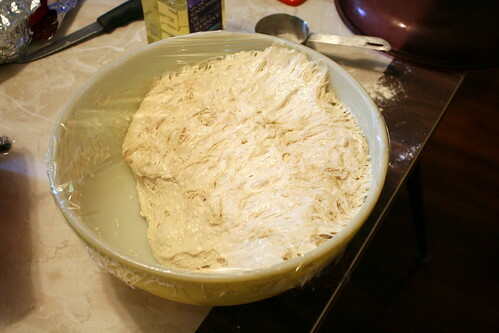 Whisk dry ingredients together in a large bowl. Add oil and milk, warmed for 30 seconds in the microwave, stirring to form a soft dough. Turn out onto a floured surface and knead gently for 2 minutes to bring together into a smooth dough. Oil the bowl, roll the ball of dough so it is oiled on top, and then cover with plastic wrap or a damp tea towel and let sit for 20 minutes. Divide into 8 balls and let sit another 10 minutes. While dough is resting for the second time, heat a heavy-bottomed pan (cast iron is recommended) on medium heat. Roll out your first ball of dough to form a circle and place into dry hot pan. While it is cooking, roll out the next tortilla. Let it brown and puff up on one side, then flip. It will probably char in places, which adds a depth of flavour. Cook on each side for 30-40 seconds. Keep tortillas covered and warm, and serve immediately after making. Can be frozen in a foil package and reheated gently in the oven.